Alaska's Glaciers: How do they happen? And do they really move? 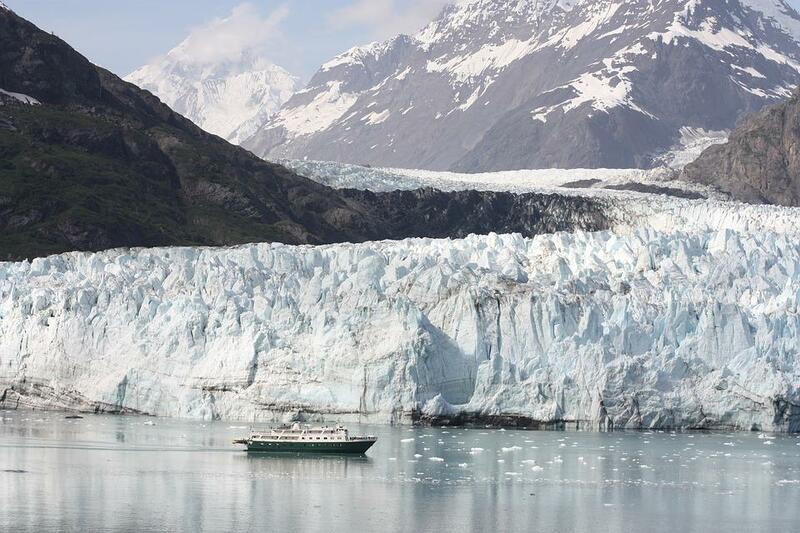 Alaska boasts many treasures, but one of the most beloved are our breathtaking glaciers. These massive sheets of ice are large enough that their pasts are carved into the towering mountains that often surround them; these glacier-made features are called cirques. These kind of glaciers are alpine glaciers, which form on the slopes and crests of mountains, Alaska has many of these. We also have many tidewater glaciers, which terminate directly into the ocean. Glaciers larger than 50,000 kilometers are called continental glaciers, like those in Antarctica. Glaciers form when snow and ice build up faster than it can melt, over very long periods of time. As they build up, or grow, they become extremely heavy, creating glacial ice. This ice looks white from the top, where tiny air bubbles accumulate, but in the middle they are bright blue! (This happens because of infrared light.) If you’re lucky, a piece of the glacier will calve, or fall off, when you’re there––it’s an dramatic and exciting thing to see, and it exposes that gorgeous color. In addition to growing and shrinking, glaciers also move! Due to gravity and that immense weight glaciers move slowly downhill, sort of like a very slow river. Glaciers leave land features called moraines in their wake, these are composed of glacial flour and silt––extremely fine sand-like substances, be sure to touch some on your trip! The Juneau Mendenhall Glacier Guided Walk via Helicopter takes you soaring through the air over rainforest, lakes, and stunning glacial ice features, while you learn all about them. Then it’s time to land––directly onto the Mendenhall Glacier! Once landed, you’ll enjoy a short guided walk on top of the glacier. Finally we have our Juneau Taku Glacier Lodge Flight and Feast, which takes you completely off the beaten path to remote wilderness. You’ll get there via seaplane, passing FIVE glaciers on the way! The Taku River will act as your landing strip when you arrive at Taku Lodge, directly across the river from Hole in the Wall Glacier. You’ll have time to wander the short walking paths, grab a drink of choice, or explore the lodge before the all-you-can-eat feast! This tour to the infamous Taku Glacier Lodge is the ultimate Alaskan experience. Your journey begins with a narrated flight in one of our seaplanes to the remote Lodge. Upon arrival you'll enjoy a delicious Alaskan meal and entertaining stories about the Lodge's colorful past. Walk off your meal while exploring one of the beautiful trails - or continue to relax at the Lodge and soak in the beauty. Join the ultimate Alaskan adventure that takes you up close and personal with the Mendenhall Glacier. Become one of the few to walk on top of the glacier surface and where you'll explore it's unique geology of rivers, and crevasses. This exclusive tour also includes a traditional native-style canoe ride past waterfalls, between icebergs, and next to wildlife to give you an unforgettable experience.